They just won’t give up, these Finnish monsters: There is one Lordi pre Eurovision Song Contest and one Lordi after. Well, it’s the same band, but the way people view them has changed since that fatal (?) day back in May 2006. Ok, so I exaggerated a bit there, but the fact is, before they won that contest, they did have some credibility. I remember both reading about them and watching a few videos by them before that contest and at first I thought they were something like a Finnish version of Gwar, which visually they kind of are, but musically not. I liked the few songs I heard and their very melodic hard rock had more in common with 80’s melodic hard rock than Gwar’s heavy / power / death metal. But when they won the Eurovision Song Contest – and they won by far – they went from being that weird, obscure, mysterious monster band with the catchy hooks to be a daycare center fest. The whole world suddenly knew about Lordi and every 6-year old had found their new favourite band, something that doesn’t go down well in the heavy metal community. Most of the rockers don’t want to be associated with any kindergarten band, especially when they dress up like monsters. Too juvenile for most folks, it appeared. So when Lordi got their big break, they also signed their death sentence because since then they have been only that band – the little kids’ band. Eight years have gone since they won the contest and the 6-year olds are now 14 and they don’t listen to Lordi anymore. Well, at least most them don’t. So who are Lordi’s fans in 2014 then? I have no clue, but that whole kids’ thing was unfair, the way I see it. Lordi were more than just an overnight sensation who got lucky. Problem is that the three albums that were released up until said contest – Get Heavy (2002), The Monsterican Dream (2004) and The Arockalypse (2008) were actually really good. But after the contest, their albums have all lost in quality and things has been going down hill musically for the band and at least their two latest records has made me almost lose all interest in the band. But I thought I’d give them one more shot with this new release. After a quick intro called “SCG7: Arm Your Doors and Cross Check”, the real opener, the album’s title track, bursts out and much to my surprise, I find it really good. A nice mix between pop and metal with a contagious melody that goes right to your brain. With “How To Slice A Whore”, I believe they take this horror stuff a bit too far. I don’t like that the title feels too close to reality, meaning these things actually do happen and with that their dark, black sense of humor gets lost and I don’t find it either funny or tongue in cheek – just macabre and tasteless. Alice Cooper once said that he would never use a knife or a gun on stage because it is too real – Lordi should have thought about that when they wrote the lyrics to this song. The song is actually really good, musically, which makes the lyrics even more of a pity. And speaking of Alice Cooper, he holds a huge influence on one of the album’s best songs, “Hell Sent In The Clowns”. It’s a really cool mix of pop-metal and evil circus music with some Coop melodies. Way to go. “House Of Ghosts” is a really good mid pace pop-rocker, “Cadaver Lover” goes back to their dark sense humor and together with a winning and catchy melody, the song becomes a real killer and “United Rocking Dead” is an all fists in the air, crowd pleasing groover and I can actually find traces of Slayer in the riffs – very cool. The big Alice Cooper influence comes back in the melodic hard rocker “She’s A Demon”, but best of all is the finishing track, “Sir Mr Presideath, Sir”, a melodic metal track with some major Accept vibes and the lyrics is not exactly pro-American. The government that is, not the American people. So when I sum this album up, I can’t help wondering who will buy this album. Word on the street says that Lordi still has trouble finding an audience older than 12 years old and they will probably always be as uncool as can be. There are way too many cred rockers out there who won’t ever give Lordi the time of day just because of their image, so would Lordi have been a huge band had they just been another melodic hard rock band without an image? Doubtful. I mean, they sure has a whole bunch of really great songs, but there are lots of bands who has that that has never made it big and probably never will. The costumes and their horror show has without a doubt made sure that people know who they are, the question is how much that will gain the band in the end. This album is surprisingly good and if you were ever a Lordi fan, this won’t disappoint, I’m sure. 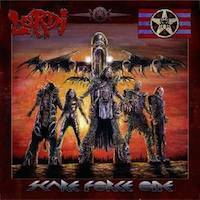 I can hardly describe myself as a Lordi fan, but their earlier albums are really good and this album sure is too. In my book, the two last albums Babez For Breakfast (2010) and To Beast Or Not To Beast (2013) left a whole lot to desire and frankly, I thought this band was more or less done. Scare Force One turned out to be a really nice come back and for people who does not give a crap about whether they use monster costumes or not, there are a whole bunch of really catchy hard rockers here to enjoy.